I'd checked into a hotel early today, in order to get caught up on all my blog work including the Kindle Blog Report. But the room was the room from hell, except we didn't find out about it until after we'd brought in all our luggage, and my mom was too tired to want to move - even though I'd do all the heavy lifting. So anyway, I can finally get on the internet now - 4 hours later - and I just don't have the energy to review any blogs today. 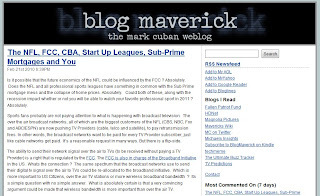 BLOG DESCRIPTION: Mark Cuban, co-founder of Broadcast.com and current owner of the Dallas Mavericks, blogs on all things in the worlds of economy and finance. MY REVIEW: I find this blog very interesting. Although I don't care for some of Mark Cuban's antics courtside, there's no denying he's an extremely successful owner of a basketball team (the Dallas Mavericks) and it is very educational to read what he has to say on a variety of topics. The blog is well written, informative, and of course with the insider's touch on the business side of running a sports franchise. This isn't a news journalist reporting from the outside on what it's like to be on the inside, it's a man on the inside, sharing his insight with us. I wish the entries would be daily, but sometimes he posts on a daily basis, sometimes there's a week in between. He must be busy! ; ) Well, that's why it makes sense to subscribe via Kindle. Why Have So Many Internet People Lost Touch With Reality? 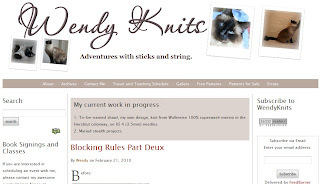 BLOG DESCRIPTION: Running commentary on knitting with advice, free patterns, and Lucy the WonderCat. If I were a knitter, I would be a reader, but alas I lack this talent. The author posts frequently, almost every day, and has been doing so since 2002. MY REVIEW: Ok, here is a mom with twin 5-year-olds. Now, you have to understand that this winter has been a B*&^% for those living in DC which is where she resides. They have had snow upon snow upon snow. 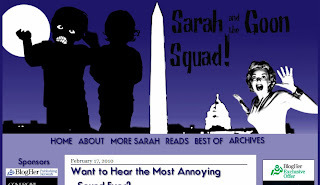 I cannot imagine continually being housebound with 5 year old twins, but Sarah has done it and lived to blog about it. The author is a good writer with a dry wit. She stays on course - focused on what is going on with her life. I especially like her comment about a rumor that there was a run on Spam at Costco causing her to question if it were a snow storm or a nuclear holocaust. She posts frequently with pictures. Great blog. BLOG'S DESCRIPTION: The site talks about movies from all across the world. MY REVIEW: The author is an Indian, Prem Shashi. His writing reflects the fact that English is not his first language. It’s very, very good…very verbose, and with just occasionally the incorrect – but closely matching – word. Occasionally some missing punctuation – but nothing too distracting. Enda Walsh is critically known for his work on the film Hunger. He is right now in line to write a screenplay based on the life of Nazi extermination camp commander Franz Stangl, according to the Australian Press. Stangl was a senior assault leader for Hitler’s SS and a commander of two Nazi extermination camps who was infamous for his quick rise to power, ruthless leadership and consequent alcoholism. (And just to be clear – “Enda Walsh is critically known for his work on the film Hunger,” would be better as “Enda Walk is known for his work on the critically successful film Hunger,” (critically in this context meaning “the critics”). Nevertheless, this slight problem with the language is a minor detail. The author is clearly very knowledgeable on films and shares lots of good info. The actual site, http://www.talkingfilms.net., also includes videos of trailers, but if you don’t have time to check the site daily, having the info delivered to you on Kindle makes sense. 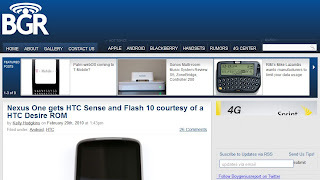 BLOG DESCRIPTION: The personal and eclectic blog of Wired Pig, a retired cop and technophile residing in the Pacific North West. MY REVIEW: An interesting blog. No real theme...the author is a retired police officer but he doesn't really discuss law and order. Most of his stuff seems to be about computer technology. The caveat is that there's lots of videos, and links, so give it a try with your two-week free subscription, to see if its something that interests you. BEAVERTON, Ore. — The City of Beaverton has expanded the scope of a celebration that started out as a party for Mexico’s Independence Day. The city on Friday announced they were broadening the festival to recognize National Hispanic Heritage Month for the “Year of the Bicentennial” in the Americas as Argentina, Chile, Colombia, and Mexico all marking 200 years of independence over the month. It was scheduled for September 16 at 6 p.m. at Beaverton’s City Park. Earlier this week, controversy erupted when radio commentator Lars Larson interviewed Beaverton City Commissioner Betty Bode to ask why the city was officially celebrating Mexican Independence Day, but had no official celebration for American Independence Day. According to the U.S. Census, Beaverton is the most diverse city in the state. Twenty percent is “non-white,” 16 percent is classified as Hispanic. Larson argued that fact did not necessarily mean of Mexican descent. A request for the event was taken from the Mexican consulate, Bode said. Bode said the aim of the celebration was to allow people of Mexican heritage into closer ties with the community at large. Beaverton’s Mayor Denny Doyle was set to speak at the event, along with performances by a Mexican folk ballet, maricachi bands and food. The cost to put on the event was $6,000 The festival is free to attend. But critics call it ridiculous, when the city doesn’t even have a taxpayer-funded Fourth of July Celebration. BLOG DESCRIPTION: Securities Docket, the Global Securities Litigation and Enforcement Report, is the industry’s most comprehensive and timely source of news, commentary and data. Continuously updated throughout the day, Securities Docket is the only publication that delivers important news and developments concerning securities class actions, enforcement and white-collar matters as they occur – not days or weeks later. Lawyers, institutional investors, executives, accountants, consultants and professionals throughout the securities litigation industry rely on Securities Docket as their “one-stop” way to quickly and easily stay informed. MY REVIEW: This is one of those blogs that I'm not really qualified to review, in one sense. This blog is for people who have millions of bucks to play with. And of course, it's about litigation - so only lawyers will really be able to benefit from this. On the other hand, it is pretty interesting to read the entries, to see how incestuous this litigation industry is...people go from one firm to another to another, and sometimes you think that the money they're talking about is play money - it certainly seems to be. And it's also interesting to see what kinds of things are being litigated - if you invest major money in stocks, I think you'll find this blog of interest. The blog is based out of England, but it does cover world-wide litigation, so US folks will be interested in it. The only caveat is that you might find it better to go straight to the website. The blog does use links a lot. They'll give a few paragraphs saying some litigator has joined this firm or that firm, and then provide a link to the press release. Weekend news is strictly links to the web. Nevertheless, check it out with your two week free subscription option, to see what you think. --Securities litigator joins Jones Day from Cooley. --White-collar litigator joins Brown Rudnick from Baker Botts. BLOG DESCRIPTION: The Boy Genius Report was founded by the The Boy Genius, one of the most popular gadget personalities on the net today. Under an assumed identity, he started out by contributing exclusive scoops for the BlackBerry 8100 (Pearl), BlackBerry 8800, Motorola. MY REVIEW: Although the ABOUT US page really didn't tell us much about the blog and its content, the post are very informative. Navigation was easy and the articles are very detailed and easy to understand (especially for us non-tech people). There are some great articles on Ipods, Ipads, Video Gaming Systems and phones, but seems to be limited to these categories - so it is great for those who are in the market for these specific items, but we thought the range of technical topics could be expanded to include many other products. 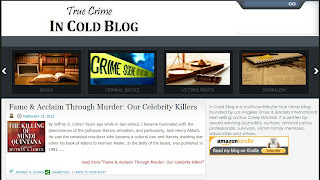 BLOG DESCRIPTION: A true crime blog authored by the leading voices in the genre. OUR REVIEW: In Cold Blog is a fascinating and invaluable blog for those people interested in true crime. Crime – and law enforcement, is covered in all its facets here. There’s a long essay on the art of writing a traffic ticket, for example. According to the author, small towns who write traffic tickets don’t actually make much money on the deal, as people who get stopped tend to believe, and a stop is always problematical for the police officer, who never knows what kind of driver he’s going to get. Highly recommended for the true crime aficionado, and those interested in the intricacies of law enforcement. The Devil’s Walk, an excerpt from “Mr. New Orleans” by Matthew Randazzo V , by Michelle McKee. BLOG DESCRIPTION: Random thoughts on the big and small screen universe of science fiction. So you must visit the website. The blog is a different story. As you see from the list below, there have been 20 posts total for the entire year of 2010. For a blog that costs $1.99, that doesn't quite cut it. However, it has only just been offered for the Kindle, so hopefully now they'll start updating it at least once a week, if not twice or more. Website - highly recommended. 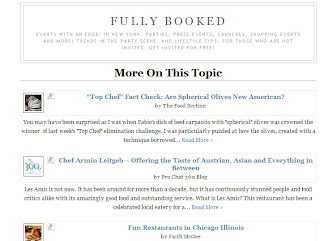 Blog - recommended with reservations. High Def Damages Classic Sci Fi? Shyamalan-bashing to become Olympic Sport? Much has been made of the homosexual agenda that some people have suggested runs under the reinvention of the universe's favourite Time Lord under Russell T Davies, but there is a more insidious plot going on here - to undermine fathers. Call Fathers for Justice and have red powder thrown at the show's creators. 'Are you my mummy?' asks the Empty Child, but he isn't asking for his daddy and why? Because the blighter's gone and done a runner. The Idiot's Lantern features an abusive father, who is so bad he has to be sent packing in the end. And I don't know why we have to 'Fear Her' in the episode of that name because it's the (again absent) father who turns out to be a monster to be feared. Where is Donna's father? We see her mum and her Grandad, but her father? Nope, not a sign. Clearly another absentee pater. Then there's 'The Doctor's Daughter' in which the Doctor gets a surrogate child and immediately disowns her and won't have anything to do with her. Good parenting image that one. 'The Next Doctor', well he just manages to forget that he has a son that needs rescuing. That's the kind of thing that slips the minds of all dads at one time of crisis or another. But it's not just restricted to the main series either. In THE SARAH JANE ADVENTURES, Sarah is bringing up Luke without a dad (admittedly through a technicality) and Clyde's father is shown to be a right selfish git who is also absent. Maria and Rani both have non-absent fathers, but they are shown to be a bit rubbish and pompous. And Captain Jack Harkness, what kind of a Dad is he, going around killing his own grandson in CHILDREN OF EARTH. So, the next time that you want to go on about supposed gay subtexts in DOCTOR WHO spare a thought to the real victims of this show - fathers. --High Def Damages Classic Sci Fi? 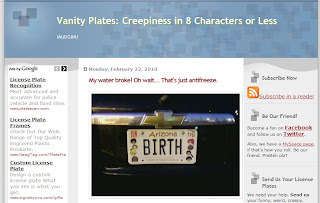 BLOG DESCRIPTION: We are a team (Mr. & Ms. HorribleLicensePlates) looking to find the most ridiculous license plates out there, because well, we think they are really annoying, and sometimes, quite humorous. Ever want to know the meaning behind a vanity plate? Want your submission interpreted? Looking for bizzare ideas for your own? You've come to the right place. We don't have road-rage, we have plate-rage. This blog is our way of venting. Thanks for stopping by. MY REVIEW: I live in an area with more than its fair share of vanity license plates, and I had often thought of starting a blog or website where I would share them with the world. But, I never got a Round Tuit and now I won’t have to, because Mrs and Mrs Horrible License Plates have beat me to it. I must say I think the name is unnecessarily pejorative, some of these plates are quite amusing or show ingenuity or something, only a small percentage of them are creepy! This is a very fun blog, and I recommend it highly. If you’re looking for a blog a day entry that can get you smiling, no need for those “joke a day” sites that take time to read and more often than not seem to be aimed only at the male of the species. Vanity Plates can put a smile on your face in half the time. BLOG DESCRIPTION: In 1918 Standard Count, the lead singer of Tapestry, Eràsis, jumped to her death at the Great Falls. One day later, hackers destroyed most biographical data. All that remains is her music, along with several archived interviews. Amkzí, a canyon woman claiming to be Eràsis, synthesized the remaining information. Her narrative expands the well-known biographical facts into a story of family intrigue and political assassination that climaxed that summer, along with the permanent depression medication that drove Eràsis to an early death. MY REVIEW: Reading this blog reminded me of J.R.R. Tolkien's work, as well as others of course - a created world with a new language that you have to learn if you are to enjoy it to its fullest. Unfortunately, the Kindle does not archive the complete blog. So to get the full effect, you need to visit the blog webpage itself, read it there unti you are caught up, and then continue reading via the blog, which is delivered to your Kindle every Tuesday. When we came down from the high several hours later, my fingers were raw from playing. Sukua braced his own wrists with wooden splints. I looked down and tried to hide the shame in my face. For the past few hours, I had not considered the delicate position I found myself in. Sitting within these walls tainted me with the same stain that made other people shudder away from their servants at the market. If anyone saw me leave — if anyone had seen me enter — they would run right to Nikis and tell them. The family’s reputation would burst like a balloon. Actions have consequences. To purge this sin against family meant something far greater than forcing me to bake bread — barring me from entering the household shrines, or even the unspeakable. I raised my hands to my face and tried to think my way out. Sukua stared at me wordlessly. BLOG'S DESCRIPTION: I am a 35 year old below the knee amputee. I am also the Mommy to an extremely active 3 year old little boy. I have learned volumes since my amputation five years ago. Being a parent with a disability can be isolating for both parent and child. I am hoping to share my experiences through humor so that other disabled parents know that they are not alone. OUR REVIEW: Tales of an Amputee Mommy is a very good blog, and an inspirational one as well. Its author, Peggy, is 35 years old. Eight years ago, she was involved in an accident that crushed her left foot. After a year or so of constant and excruciating pain, she decided to have her foot amputated. She is now fitted with a prosthetic device, and she and her husband have a three year old son. I don't want to simplify the work necessary to recover emotionally from an amputation. It was not an easy journey. My surgeon recognized the depression and body issues and set up counseling sessions with a specialist in the field. Unfortunately, the insurance company denied the request stating that the amputation was "elective" and that I, therefore, shouldn't have emotional issues. I was forced to maneuver through the transformation without expert guidance. I struggled with my identity as an amputee, and as an amputee woman. It took years before I could look in a full length mirror and not tear up. Although I believe I have worked through the pain and the issues, I still have bouts of "the amputation blues." My Stump is Ugly! But I am Not. Organization is in the Bag. BLOG DESCRIPTION: I'm just an innocent cashier stuck in a world of irritatingly annoying people I like to call Customers. I started working in the customer service industry when I was around 15 years old. Yes, that's when I was old enough to help out with the family business. Since then, I've been called names, yelled at, threatened, flirted with, and generally disregarded as a member of the human race. I'm a cashier, and this is my revenge. --Where Did You Wipe That? --Do You Have 23 Cents? --Come On Now, Are You Serious? BLOG DESCRIPTION: The written word is something that you never grow out of. It entertains, educates, and shocks. It can cultivate previously unknown senses, and it carries the ability to change the way in which we engage our world. From dystopian fiction to murder mysteries to chick lit, this page is dedicated to the words and sentences that shape our character and divert us from the mundane. It's a new blog - 7 posts in September, 4 in August. But this is very promising, so check it out. Today, I have the pleasure of posting an interview with Helen Smith, author of Alison Wonderland, Being Light, The Miracle Inspector, and assorted plays and other works. I was digging through your blog, and I have to say, you're quite the multitasker! Poetry, novels, plays . . . What frame of mind are you in when you're writing? Does it vary by genre? Any specific rituals to get into the mood? When I’m at the planning stage I generally feel quite cross – as if I have set myself an impossible task that I will never complete. When I’m writing and putting down a couple of pages a day, I feel joyful – as if it’s all flowing from somewhere and it will be brilliant if I can just keep going. When I’m editing, I feel serene; the hard work has been done and I’m just tinkering with the text to improve it. I find it easier to write prose than to write drama. There’s so much you can’t do in a script: you need to rely on the actors to convey the internal life of their characters, the director to set the pace – and create a sense of place - and the designer to create the mood and atmosphere (among all the other things they’re supposed to be doing). I love it that I can jump around in place and time in a novel if I want to - and it’s all done without budget constraints. I don’t have any rituals. It sounds like a taxing experience! Let's focus on something positive, then: what is your favorite part of the publishing process, and why? Doing the deal/signing the contract. There’s nothing so exciting as getting a call from my agent to say, ‘I hope you’ve got some champagne on ice.’ Actually I think she only said that to me once, when she sold my first novel. I did have some champagne chilling, as it happened. When someone says ‘yes’, you feel that nothing can go wrong now – the hard work has been done and the rest of the process is out of your hands. Good planning on your part with that champagne. I'm certain that it wasn't always smooth sailing, though. What is the hardest lesson that you've learned through your experience as a writer? I learned that the hard work is not over once you sign the contract. If you want your books to sell you need to get out there and help to sell them. Fair enough. Speaking of hard work, what is your greatest literary fear (e.g. pedestrian writing, stilted dialogue, inconsistent characters, etc.)? How do you overcome it? I don’t want to bore the reader. I cut a lot in the final edit. Well, you certainly haven't been boring them! What about your own entertainment? One always wonders what sorts of books are sitting on an author's shelf . . . What do you read in your free time? Does it have any effect upon your writing? I read literary fiction, mostly – and a few biographies and autobiographies. If they’re brilliant they tend to make me feel slightly despondent about my own work. But I love reading so much that I get over it. I don’t read anything when I’m at the ‘writing’ stage of my work, for fear that the author’s voice would influence mine. I’m too busy anyway, when it’s all going well – I want my head to be filled with whatever I’m working on, rather than puzzling over someone else’s novel. True. While we're on the subject of writing, let's take a look at Alison Wonderland. I have to ask: what scene/line is your favorite, and which character(s) do you best identify with? There’s a little bit of me in all the characters. I was developing a TV series based on the novel for the BBC (it hasn’t gone into production yet, the development process has stalled, as it so often does with these projects) and one of the producers kept calling me ‘Alison’. But she’s not much like me, really – she’s much grumpier and has very little insight into her own feelings. I’m probably more like Mrs Fitzgerald, the boss of the all-female detective agency Alison works for. She’s outwardly calm and in control, but she’s troubled by strange thoughts. I like the scene where Alison and her best friend Taron are waiting in the car at the seaside, at the end of a strange and at times unsettling trip to Weymouth. It’s a turning point in the book and what happens at the beach will change Alison’s life, though she doesn’t yet know it. That’s the scene depicted on the front cover of the latest edition of the book – the designer came up with it after reading the book, so I suppose it was a memorable scene for him too. It will certainly be interesting to see what the BBC makes of your series. And now, for something completely random: If you could be any character from any novel for a day, who would it be, and why? Quite often I read books with antiheroes but I’d like to be a kind of superhero – a woman, of course - and be able to fly and save the world. Since I can’t think of anyone like that in any of the novels I have read (perhaps I should write one), I’ll go for Miss Marple. I loved Agatha Christie when I was younger and I have read most of her books. I always preferred Miss Marple to Poirot. I would like to be a nosy, wise old lady and solve mysteries and knit. I’m already quite good at knitting so I’d slip into the role fairly easily. In fact, I think I would like it so much I might be reluctant to give it up after only one day. I can't say I blame you. Well, I suppose that's it. Thanks for answering my questions today. Thanks for tailoring them . . . and for looking through my blog, too. •resources for those who are interested in building their own homes. •and the day by day ramblings in my blog. MY REVIEW: The Hermit lives completely off the grid – his home is solar powered, and the resources include solar powered ones. (Once the concrete slab for his home was poured, all electricity to power tools has been generated by the sun). For anyone interested in solar power or alternative energy and how it can apply to your lives, you’ll enjoy this blog. •Local food: a discussion of San Luis Valley – the “breadbasket of Colorado” – and how stores in the area ship produce from other locations. •Building materials: He gives a plug to Jim’s Post Commissary, where he purchases all the basics for building his home and the La Jara Trading Post – a huge hardware store. MY REVIEW: An excellent blog for investors and those interested in the financial future of the country... told from the New York Times' point of view! The long-awaited opinion in the Selectica case came out this week from Delaware Chancery Court. Vice Chancellor John W. Noble, in the 71-page opinion, validated the Selectica board’s decision to adopt a net operating loss poison pill and permit this pill to be set off after Versata intentionally crossed the pill’s threshold. So, regardless of your political affiliation, this is a good blog to read. It cost $1.99 a month rather than 99 cents of most blogs. -McCain: I'll Cut Deficits Like Reagan! -Jim Bunning's hold is also killing "flood insurance"
BLOG DESCRIPTION: Do like the comics? Do you like making fun of the comics? Of course you do! Read the Comics Curmudgeon for all this and more. MY REVIEW: I heartily recommend The Comics Curmudgeon, if you like to read the daily comics (for whatever reason. I read some of them because they’re so bad they’re good, for example, and that seems to be the reason the Comics Curmudgeon reads them, as well. (My own favorites (favorites because they are good, not because they are "so bad they are good!") are Brewster Rockit and Rip Haywire. I wish my own strip, The Lady and the Tiger (about a woman pilot), was represented. Well…perhaps one day. 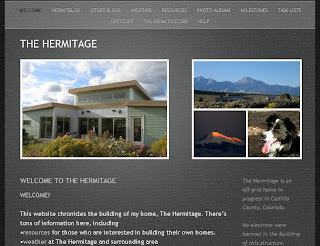 BLOG DESCRIPTION: [This blog] is based around my family and our life. I share experiences from being a mom, eating healthy foods, caring for my kids to working with major companies to review products we would otherwise buy. 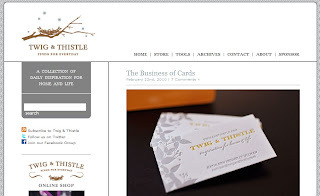 MY REVIEW: This is a combination blog/ commercial site. The author reviews various children's products. She also talks about life with her husband and two children. If you're a parent, you'll find this blog of interest. Lots of good stuff here, both for those who want to save money on kid's stuff, and for those who want to read about other parents raising their kids. BLOG DESCRIPTION: Our story is one of the many family stories of America. Aren't we still adventurers and explorers, risk takers and seekers? As our lives and individual stories continue to unfold, we play a small part in the history of this nation and the world just as our forefathers did. This story, our story is written every day by each of us as we live our lives, raise our children, solve our difficulties and pursue our version of the American Dream. MY REVIEW: I enjoyed this blog -- it's always interesting to read the histories of people who lived so long ago, and of people today who are able to track their ancestors back so far. Geneaologists and people interested in history will enjoy this blog. There is one flaw, months can sometimes go between posts. Nevertheless, it's got some interesting stuff there, so check it out. 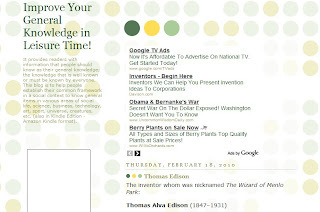 AMAZON SUBSCRIPTION PAGE: Improve Your General Knowledge in Leisure Time! BLOG DESCRIPTION: It provides readers with information that people should know as their general knowledge; the knowledge that is well known or must be known by everyone. This blog is to help people establish their common framework in a social context to know general items in various areas of social life, science, business, technology, art, sport, universe, creatures, etc. It presents the information in an easy way to read, memorize (also to improve memory) and self-test. So readers could improve their general knowledge while enjoying their leisure time. MY REVIEW: Each entry in Improve Your General Knowledge is simply a piece of trivia. Jeopardy: The American quiz show featuring trivia in topics such as science, literature, history, music, culture, sports, etc. Cold Mountain: wounded soldier, Inman, leaves the Civil War and walks home to his sweetheart Ada in Charles Frazier’s book: Cold Mountain. The Falkland Islands: IN 1842, the British made Stanley the capital of the Falkland Islands of Argentina. Well, the trivia is interesting, and it can certainly act as a spring board to do further research, should you find one of the trivia pieces is interesting. I just wish that each piece of trivia would actually give a bit more information. Two paragraphs are better than one! BLOG DESCRIPTION: History of the 12,000+ Cessnas sold by military air arms worldwide since World War II. Book excerpts. Articles. Artwork. Military Cessna flight manuals. MY REVIEW: If you go into the archives (on the web), there are some great and informative articles (about 3-5 a month for 2009). 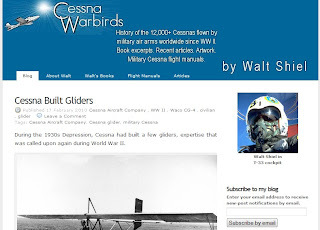 As an aviation enthusiast (my own aviation blog is - You Fly Girl: Women in Aviation), I was looking forward to learning about Cessna Warbirds, from this blog by Walt Shiel. He’s the author of the book, Cessna Warbirds, as well as T-41 Mescalero, Cessna Warbirds Vol. 1, Devil in the North Woods (Novel) and Pilots and Normal People. Unfortunately, his blog is not updated as frequently as I would wish - although the last update was February 17, 2010, so I've moved him from the inactive file into the active file. FYI, Shiel has another blog, www.waltshiel.com, entitled View From The Publishing Trenches, about publishing, which makes for interesting reading also. Pass the green beans and the pot, please. BLOG DESCRIPTION: The web's largest resource for Jimmy Buffett news and tour information. 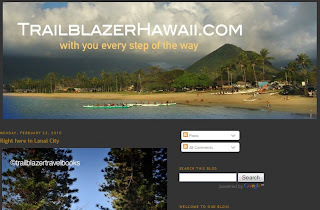 MY REVIEW: If you are a fan of Jimmy Buffett, this is a must have blog. Of course, at the actual website you can participate in the message boards, but if you just want to read the posts, this will be fine. BLOG DESCRIPTION: Household and green living tips, online coupon codes, organizational tools, freebies and anything else to help you save time, money, and sanity. MY REVIEW: This is another one of those blogs where you really need to visit it on the web to take advatage of it, as you have to sign up for things and print coupons from the site. However, what you can do is subscribe to the blog, and read it (it's updated daily) and if you see something that interests you, then take the time to go to the web to check it out. --Three FREE issues of Seventeen magazine! 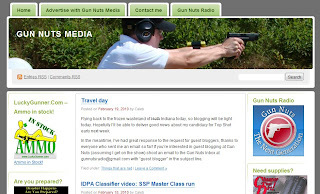 BLOG DESCRIPTION: Gun Nuts Media is one of the premier online sources for information on the shooting sports, new guns, gear, events. We also provide up to date coverage of political issues surrounding the right to keep and bear arms. MY REVIEW: Gun Nuts Media is a blog that is newly available for subscription by Kindle, but has been around on the web since 2006 (at http://gunnuts.net). It’s found in the Sports section (where I found it) and also in News, Politics and Opinion. The blog is for gun enthusiasts who like to target shoot, in various events, and secondarily about protecting people’s rights to bear arms. They also have a radio program. The blog entries talk about everything gun related, from the laws about gun ownership to the individuals involved in the sport. PERSONAL NOTE: I would love to take up target shooting as a hobby... if only ammunition weren’t so expensive! In any event, for those are in to target shooting and collecting guns and so on, this is an excellent blog. BLOG DESCRIPTION: Commenting on the catchy and trendy, the trivial and tremendous, the Amazon Daily blog highlights the best from the world's largest online retailer. Whether you're interested in the tops in technological toys, the quirkiest gadgets or preeminent foreign films, Amazon Daily offers a plethora of diverse opinions from the editors of Amazon.com. From the perfect holiday dinner to the craziest car accessories, Amazon Daily covers Amazon.com's huge catalog of items, gizmos, books and food. MY REVIEW: This blog is well written, it’s interesting, and its free. Any flaws? Well, its subjects are on a wide variety of topics. If you are interested only in books, only in music, only in movies, then there will be a lot to wade through. But if your interests are eclectic, you’ll want to read this over your morning coffee. The Book Behind Brad Piit’s Beard. Why is Pitt wearing that weird looking beard. Not because he likes it, thank god (although I suppose he might), it’s for a film he’s making, The Lost City of Z.
Neil Gaiman writing an episode of Doctor Who. Ian Brown has won the Taylor Prize for non-fiction for The Boy in the Moon, an account of the life of his disabled son. Gearing up for New York’s Fashion Week, an interview with Herve Leger’s Max Azria. Stile Antico: Media Vita. Review of a vocal ensemble that specializes in Tudor and Renaissance Choral music. Photo, and links to various websites, but all info a reader needs to know is in the entry. Justice Leage: Crisis on Two Earths amazon exclusive clip. It’s an animated movie, and of course you can’t watch it on the Kindle. Literary Superbowl – commentary on authors from Louisiana and Indiana. A list of several books, each one linked to its appropriate purchase page at Amazon – but not a Kindle page (but then, this blog isn’t written exclusively for Kindle readers). BLOG DESCRIPTION: This is a blog unlike any other on the net. A father, Valentine Cawley, writes of his well known scientific child prodigy son, Ainan Celeste Cawley, and family and tells of life as an expat in Asia. Ainan spoke his first word at a couple of weeks old, crawled at four months, walked at six months, ran at eight months and read his first letter at eight months. At seven years old, he passed O level (the youngest in the world). At 8 years, he went to his first College for Chemistry. The blog takes an insightful look, at the life and world of a unique child prodigy and his family. Ainan's story was covered on the front page of the Wall Street Journal, and in hundreds of other major newspapers around the world. MY REVIEW: This is a fascinating blog on a fascinating subject - that of child prodigies. Kids who are smarter not only than every other kid in the room, but also smarter than every other adult in the room as well. I found this blog a fascinating read, and I recommend it for everyone who has gifted children, extremely intelligent children, or just children in general. Fintan, seven, is, as I have noted, before, a boy who surprises. He has a disarming manner which lulls one into a sense that all is to be as expected - and then he pounces with one of his characteristic unpredictabilities. If an "unpredictability" can be characteristic, of course. Today, he bested me, twice, in conversation. I was discussing reading with him. "Reading is the most important skill in life. ", I opined, seriously. "Reading? ", he doubted, openly, "Not walking? ", he continued, with one of his little smiles that says so much with so little. He had me there. I imagined then, a life of utter immobility and compared it to a life of illiteracy. He was right: immobility was worse than illiteracy. The former quite deprived one of a rich life - the latter, however, might not affect one, anywhere near as drastically, if one's choices were carefully made. He had won, without even trying. I just nodded, a little, in acknowledgement of his point. Later that day I said: "I am going to buy a dog." Fintan looked at me, his eyes sparkling, with amusement at what was to come. "You don't want to buy a dog, you should rent one." Again, he had a point, for we are very unlikely to live in Malaysia for the length of a dog's life: what would we do then, when the time came to leave? He had identified the essential problem with my proposal - and proposed his own slightly whimsical solution. I like the way he challenges my assumptions, points them out to me and punctures them. He does it so casually, as if, perhaps, it were an automatic reflex with him. I think it is, actually. I think he sees the problem with what is said to him, the moment it is said. He sees the cracks in things - the flaw that should be highlighted for a better understanding of the situation. It is a useful way to think, particularly if developed, as he grows up. It should allow him to avoid many a problem and to act, I should hope, with a certain care and wisdom. In the meantime, I will continue to enjoy being defeated by my son's ripostes. It makes me smile, to hear him so. 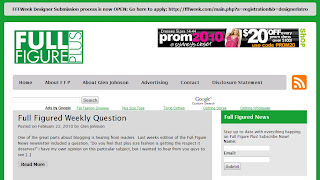 --How long is my blog? --Publishing my blog on Kindle, Amazon. BLOG DESCRIPTION: Written from the perspective of people who live, work, and play here every day, Metroblogging New Orleans is one of over forty-five (and growing) blogs in the globe-spanning Metroblogging network. Get comfortable and have a look around if you'd like to know more about New Orleans, and have a peek at the authors who share their New Orleans experiences with you. MY REVIEW: An interesting blog. Unfortunately, it seems to be updated once a week or once every 10 days only, but then, that's the joy of having a subscription via Kindle, you don't have to worry about checking the blog every day, because it'll be sent to you when it's finally updated. If you're interested in how the city is holding up 5 years after Katrina, and now how they're doing thanks to the BP oil leak (and let us not forget, as they seem to do, that the US goverment is the one dispersing claims money, not BP) you'll find this an interesting blog. Why so many retro reviews? Catch up after Labor Day!